Read Articles by The Tinman , showing how to use these products. Also learn very practical techniques for welding, brazing, aluminum repair, and much more. Shrink Fast and Deep! These will completely change the way you make panels and skins. 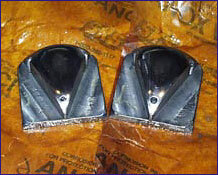 These dies are featured in our videos: " An American's View of the English Wheel " and " Shaping Aluminum Wheel Pants ." The real magic of Yoder, Pettingell, Whiting, and Quickwork power hammers are the shrinking dies, according to many "hammers" Kent has spoken with and worked with. But why buy and install a persnickety power hammer costing many thousands when other sheetmetal forming machines are cheaper and easier to use? Aha! Our shrinking dies have been precisely made to fit the common electric reciprocating machines (with .100" stroke)�Pull-Max, Baker Tru-Edge, Lenox, Metl Mastr, Wales, Seecrest, Savage, Campbell, Gairu, Vibro-Shear, and Ta Ming. Set includes posts fit to your machine. 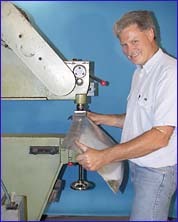 Post length and thickness must be specified to .001". Constructed of 4130 non-heat treated steel with rubber shock pads to reduce vibration and noise. 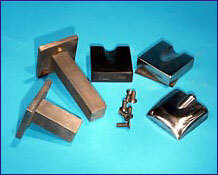 Consists of the above two-piece die set and another upper die of aerospace polymer for non-ferrous soft metals. 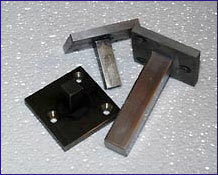 Die posts for electric recip machines. Made to fit your machine. You must provide accurate dimensions to .001"
Made from mild steel, and fit our Saddle Dies and Shrinking Dies. 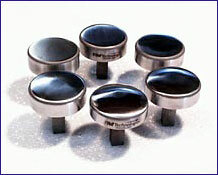 These dies are designed for making reverse compounds ("saddles" and "ducktails"). They work fast and efficiently. Made from mild steel. (Dieposts NOT INCLUDED in this price)"
6pc. set includes 2 flat dies and 4 different contours up to a high crown. Use any combination of these as upper and lower hammers, to enable many shapes.